A group of 39 P6 students from Harrington Sound Primary School took part in a plankton tow as part of an annual program that introduces them to local marine flora/fauna through the various research and education programs that are ongoing at BIOS. 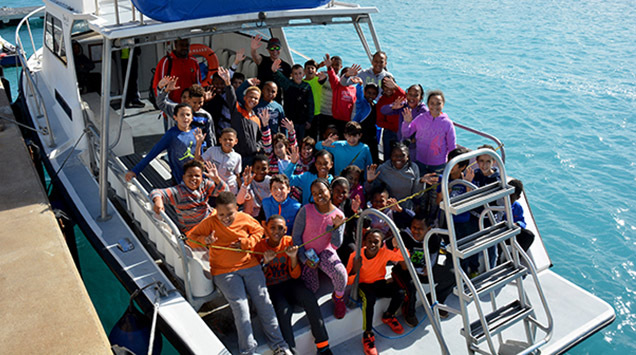 Last month a group of 39 P6 (primary school level 6, or grade 5 in the U.S. school system) students from Harrington Sound Primary School spent three days and two nights at the Bermuda Institute of Ocean Sciences (BIOS), where they learned about the local marine environment and potential career paths in ocean science research, technology, and education. Cindy Weeks, acting principal at Harrington Sound, conceived of this educational experience while working as a science teacher at the Whitney Institute and looking for innovative ways to engage her students in real-world science. As a result, for the last six years, the P6 cohort of students has been able to experience what it’s like to learn and conduct science while living at a working research station. Over the course of their visit the students learned how to use microscopes to examine marine organisms (including flying fish eggs), took boat trips to Cooper’s Island and caves at Walsingham Nature Reserve, completed math and science lessons using data collected from the beach, and made presentations to their teachers and parents about what they learned. 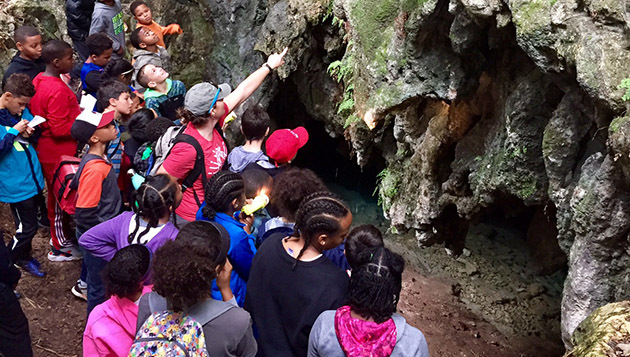 Kaitlin Baird, BIOS science educator, leads students on an expedition through Walsingham Nature Reserve to learn about the geology of cave formations. Maderios led this year’s PTA efforts to fundraise for the trip, hoping to give every P6 student the opportunity to participate without adding financial burden to families. BIOS contributed through its Ocean Academy curriculum enrichment field trip grant program, which covered everything except room and board for the students. The Neil Burnie Foundation, created in memory of Dr. Neil Burnie and committed to carrying out his mission to support local marine research, environmental education and preservation, stepped forward to sponsor 10 students for the trip. Other donors included the Bank of Butterfield, RenaissanceRe, P&M Electric, Argus Insurance, as well as individual donors within the community. For more information about education programs at BIOS, please visit www.bios.edu/education or email oa@bios.edu.